When your life is simplified like this, you learn to appreciate everything else. Fresh spring water, a smooth trail free of rocks, the sun on your back or just a simple hello from the locals. I calculate my mileage is a little high, I’m aiming for around 25 miles per day which is a decent distance. Rabe de las Calzadas appears, shimmering in a heat haze. I enquire at two Albergues but they have no room. I curse. I have camping equipment with me but the nights are cold, down to around 8 degrees C. Not cold as such but too cold for the quilt I have brought, even if I wear all my clothes. However, I have little option and stop to fill up on water. The wind increases which won’t help the situation and I move on, remembering a sheltered spot a further mile on which I passed last year. I set up camp and peer into the depths of my food bag. All I own in the sustenance department is two peaches and half a stale baguette. Coming back to the simpler things, they actually work together surprisingly well, something like a peach cake. By nine, a cold, fierce wind is sucking the heat right out of me and I crawl into my tent, put on all my clothes and wrap the quilt tightly around me, curling up to preserve what body warmth I have left. It’s an uncomfortable night with little sleep. I’m going by 7am, making a beeline for the next village, Hornillos del Camino. The bar owner takes one look at my face and fires up the coffee machine, obliging my request for a cheese and ham sarnie. He is surprised when I comment about the temperature, especially being English. Apparently, cold nights and hot days are the norm for this time of year in North Spain. 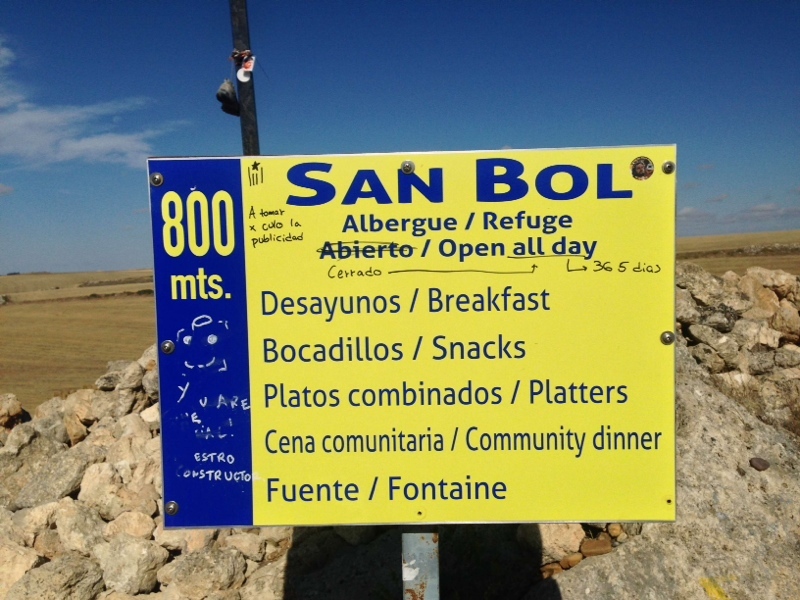 The San Bol refuge appears to my left, an oasis in a long, barren stretch. I pass through Hontanas where the locals will tell you that the water from the church fountain is very healthy. I drink a litre and take another litre with me. 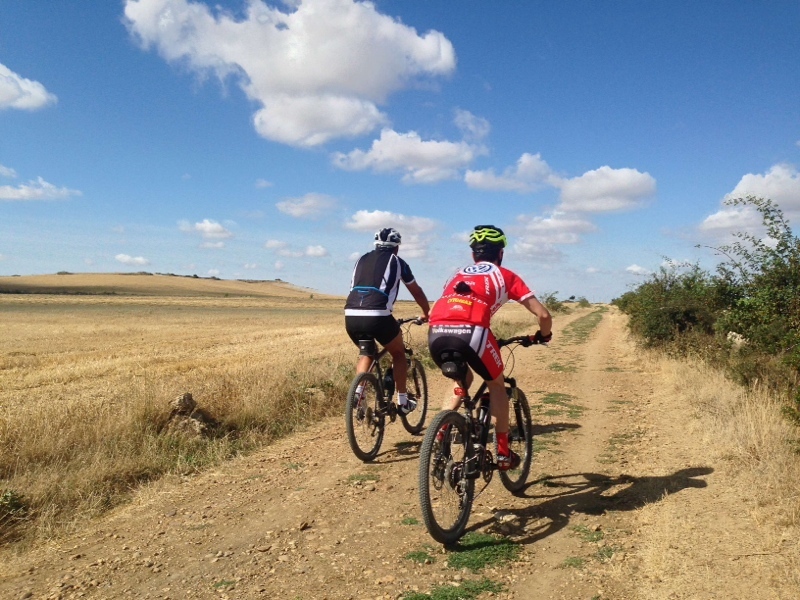 I descend out of the village, cross a quiet country lane and climb away from it, riding a high wave for four miles before it spills me out on the road again at the Convento de San Anton. Pilgrims leave messages for others on scraps of paper here, weighed down by small stones and sheltered in a stone hole. 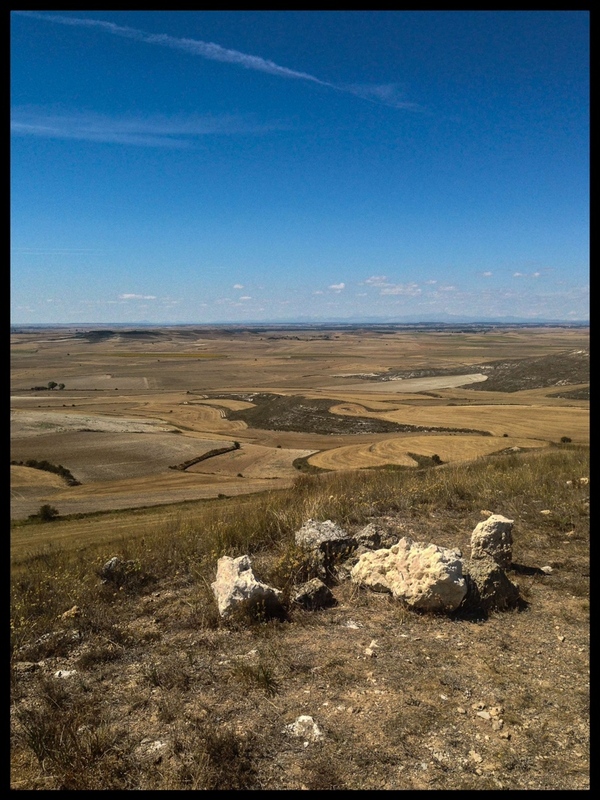 I hope to catch a glimpse of Castrojeriz from up high but it doesn’t appear until a couple of miles later. A straight road, a datum, converges just on the edge of town. Trees line the edges like sentries, providing shade and casting shadows across the Tarmac in regular patterns. The castle dominates over a cowering Castojeriz, it’s tales of bloody battles diminishing with the years. 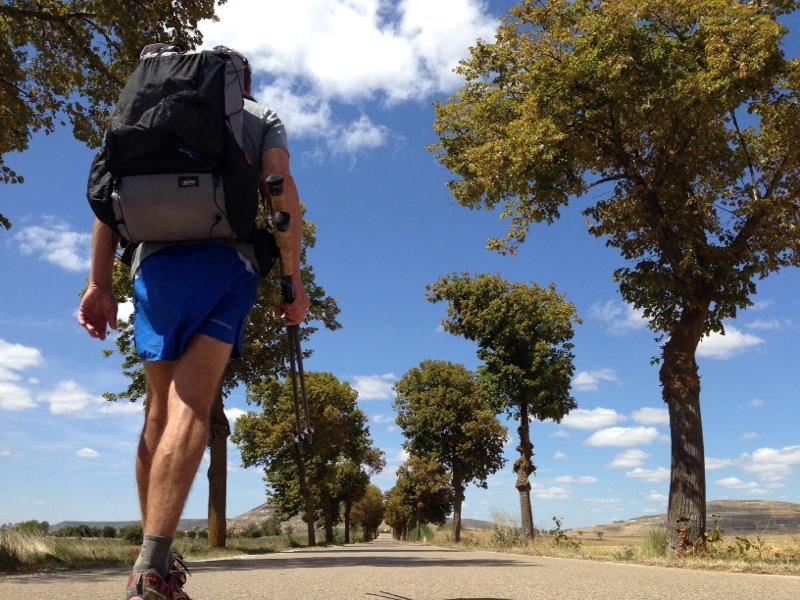 A mile further on from the village and the Camino climbs to just over 900 metres onto the Alto de Mostelares. The plateau continues for a similar distance before dropping off to startling views. This is what I consider to be the start of the Meseta proper. A far reaching panorama stretches out in every direction, deep blue skies interrupted only by soft clouds casually drifting across the plains castings shadows like moving apparitions. The Camino weaves ahead of me, dotted with an occasional pilgrim up to a small, shaded, resting place with a fresh spring, visible but three miles distant. After a small break there in a welcome shade, I stop for another day at the next village. I leave my overnight stay at the Puente Vitero Albergue with no promised English breakfast again (it happened last year as well). I do leave with a hangover, a shin splint and some fresh blisters though. My mood slumps as I trudge the five miles to Boadilla del Camino, waiting for the sun to come up and the promise of the relative oasis of the Albergue en El Camino where I know a decent breakfast does lurk. Sure enough, the famous limitless coffee pot hangs aloft my cup as a steady stream of black trickle mesmerises me and slowly, my body warms and responds gratefully. Gradually, a rising sun emerges over the horizon behind me. My shadow appears stretched out before me, facing west. During the course of the day it shrinks and follows a path to my right like a clock silently ticking. At days end it will be behind me, gradually lengthening once more. If you get lost on El Camino, your shadow may not be the most reliable compass but it won’t be far off. By the time Fromista appears, I walk straight through the town, warmed up and on a roll. 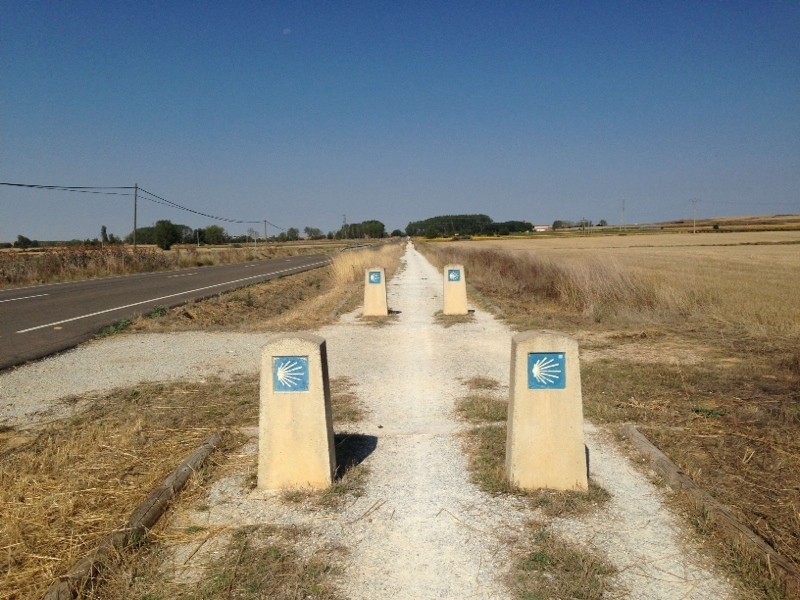 Shortly after, at Palomares, the Camino splits to provide two options. Most pilgrims (for some reason), continue by the side of the road to Villalcazar de Sirga, one of many similar, upcoming road sections. I turn right and follow what I believe is the Camino of old which is slightly longer but basks in the solitude of being away from the road. An old pilgrims bridge at Vile-veico suggests it may be the traditional route and an unexpected bar serves me a delicious bocadillo. 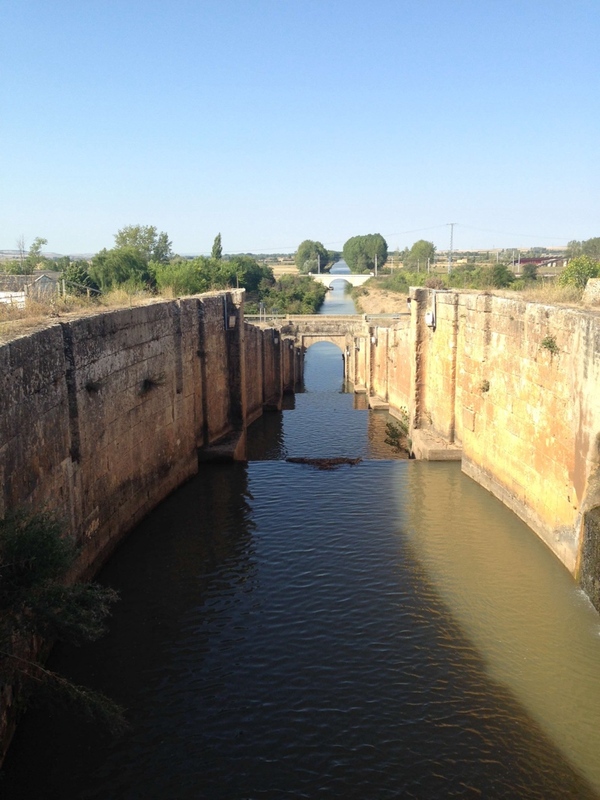 Carrion de los Condes is my destination for the day and I head straight for the Convent de Santa Clara, a gem of a place to spend the night. Not a bunk bed in sight and although a little dated inside, it’s the sort of place that’s so clean that I half expect to see a couple of marine recruits down on all fours cleaning the grout lines with a toothbrush. 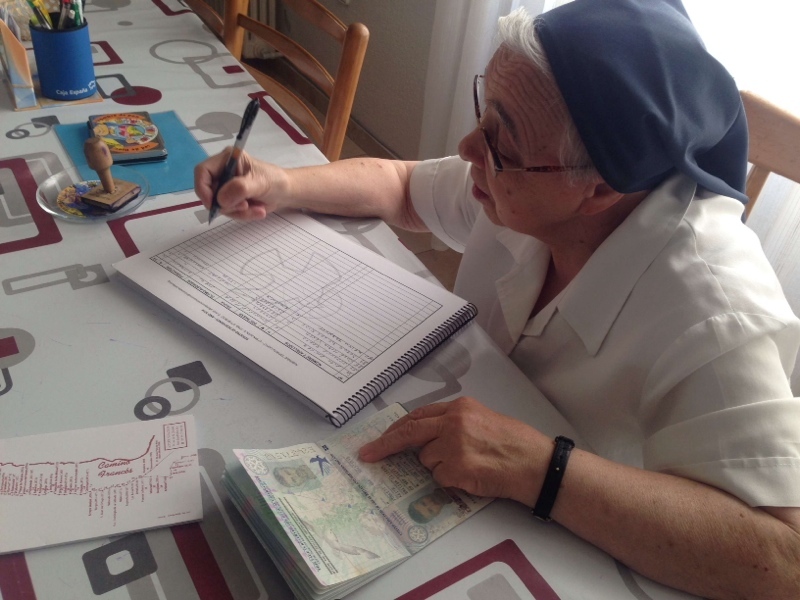 An elderly nun checks me in, scanning my pilgrims passport, and actual passport, with a discerning eye. take off her pack. Another appears with a bag of ice for her friends sore shin whilst food is shared. I see it here, I’ve seen it on the Pacific Crest Trail, the Appalachian Trail and most places I walk. People helping each other, it’s a nice place to be, you know someone, somewhere, will always help you out. Occasionally, you just have to give a little and it comes full circle.